In the context of the research project “Figures of Dissent (Cinema of Politics, Politics of Cinema)” KASK / School of Arts, www.kask.be. Luc Moullet once described him as a “blue collar dandy”. Legend has it that he aimlessly roamed the streets of Paris, regularly spending his nights in the Montparnasse bars, continually venturing into new romantic liaisons, but the self-conscious Rimbaudian romantic artist was also an autodidact filmmaker whose work was steeped in an artisanal ethos and a penchant for sharp observation and ruthless provocation. This apparent paradox, which was at the heart of many of his films, never sat easily with the French film culture that came after the heyday of the Nouvelle Vague, which all too often succumbed to ideological blindness and bitter antagonism. 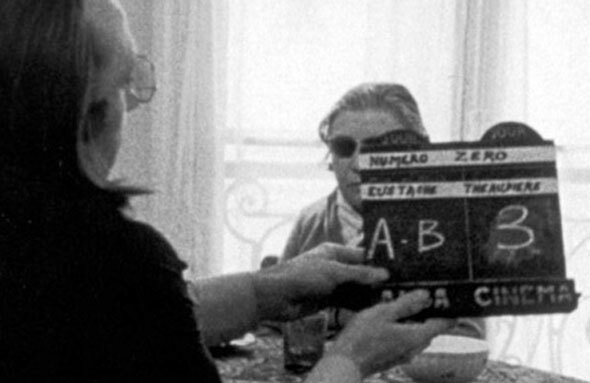 That is how La Maman et la Putain, arguably his most autobiographical project, was dismissed as “deeply reactionary” on the pages of Cahiers de Cinéma, who put it on the same level as other “petit-bourgeois” movies such as Ferreri's La Grande Bouffe and Bertolucci's Last Tango in Paris. But Eustache’s character study of the lost children of post-’68 did not rest on ideological premises, but on his intimate understanding of the tremors of disquiet and anguish that ran through the streets of his city. Always the “ethnologist of his own reality”, as Serge Daney wrote in his obituary. Always the artisan who took on everything as it came, memorized everything as it presented itself. Always the non-conformist whose films followed their material right to where it led them, and never to where conventional guidelines were pointing them to. Always the renegade who resembled his times too much to be comfortable or contended. A constant struggle he ended up losing. This film, which has remained unseen for so long, is what he considered to be his “numéro zero”, his tabula rasa with everything that had come before. A film that is unsure of itself, a manifesto without a program, made without any intent or pretense, only answering to a single desire: the desire for cinema.